Education is also an important concern. A median of 23% say improving education should be their nation’s top priority. In South Africa, education is named more often than any other option. To a lesser extent, people in the region are also worried about issues such as corruption, food supply, infrastructure and energy. Despite the progress that has been made, and widespread optimism about the future, people in sub-Saharan Africa still believe their countries need assistance from abroad. Across the nine nations in the study, a median of 68% think their country needs more foreign aid than it gets today. The outlier is South Africa, where just 26% hold this view. These are among the key findings of a new Pew Research Center survey, conducted in nine nations among 9,062 respondents from March 25 to May 21, 2015. Pew Research Center is a subsidiary of The Pew Charitable Trusts, its primary funder. This report was made possible by The Pew Charitable Trusts, which received support for the survey from the Bill & Melinda Gates Foundation. Overall, people in the region express at least some confidence that major institutions will be able to deal with the challenges facing their countries. Most believe that governments, foreign aid organizations and businesses can help solve key problems. However, people believe that these institutions have both important strengths and significant weaknesses. In most countries polled, people express the greatest faith in their own national governments. A median of 78% across the eight countries where the question was asked say they are at least somewhat confident that their national government will help solve major problems in the country. Still, Nigeria is the only nation where a majority is very confident.2 Moreover, it is clear that people do have serious criticisms of their governments. Large majorities consider government corruption a very big problem, including about eight-in-ten or more in Tanzania, Ghana, Nigeria and Uganda. And majorities in most countries believe government is run for the benefit of a few groups rather than the benefit of all. Foreign donor groups also receive largely favorable ratings. A median of 70% across all nine countries surveyed are at least somewhat confident that these organizations can help solve major problems in their country, including majorities in every nation polled. 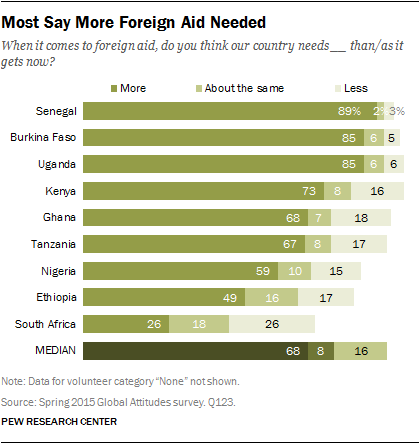 A median of 68% describe foreign aid programs as effective and 60% say they benefit people in need. Still, these positive views are tempered with doubts. Smaller, yet still significant, shares perceive these foreign assistance programs as corrupt (median of 53%) or inefficient (45%). 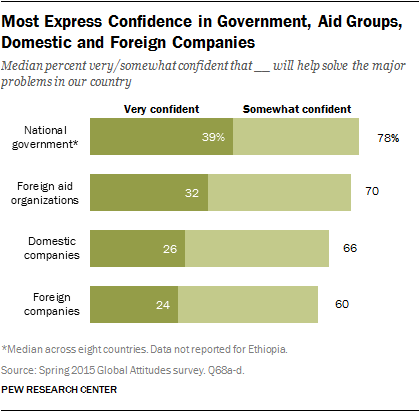 And there is no country in which a majority is very confident in international aid organizations. 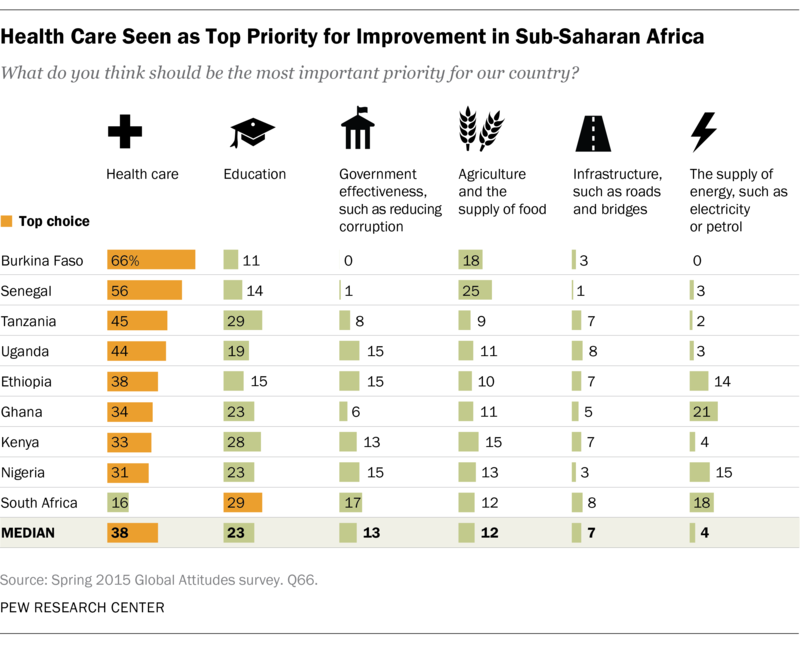 Most also believe the private sector can help address the challenges facing their country. A median of 66% express confidence in domestic companies, and 60% say this about foreign businesses. More specifically, foreign companies involved in extractive industries are seen in a mostly positive light. 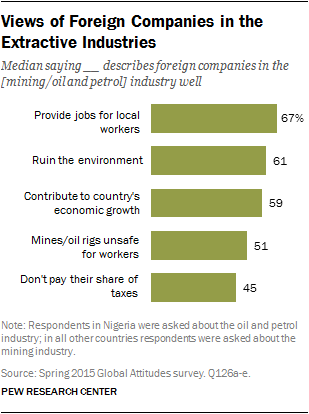 In eight nations, respondents were asked about the impact of the mining industry in their country, while in Nigeria, where oil is a major export, people were asked about the oil and petrol industry. In all countries, more than half say these companies are having a positive impact, including about seven-in-ten or more in Kenya, Nigeria and Uganda. A median of 67% across the nations polled say extractive companies are providing jobs for local workers and 59% believe they contribute to economic growth. At the same time, as is true for the government and nonprofit sectors, people have some concerns about these for-profit industries as well. A median of 61% believe foreign extractive companies in Africa are causing environmental damage, while about half (51%) say the mines and oil rigs are unsafe for workers and 45% say these firms do not pay their share of taxes. The survey finds that, compared with other parts of the world, people in sub-Saharan Africa are feeling relatively positive about the economy. Many nations in the region have enjoyed strong growth in recent years, and it is clearly having an impact on public attitudes. And when asked about the near-term economic future, sub-Saharan Africa is the most positive region of the world. A median of 60% believe their nation’s economy will improve in the next 12 months. Latin America is a distant second at 44%, and Europe trails the world at 24%. 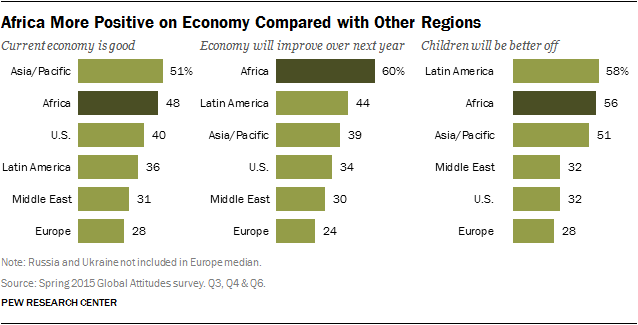 Over the long term, Africans are optimistic about the economic prospects for the next generation. A median of 56% in the region believe that when today’s children grow up, they will be financially better off than their parents. About seven-in-ten or more hold this view in Nigeria, Ethiopia and Burkina Faso. Tanzania, Kenya and South Africa are the only nations in the region where less than half are optimistic for the next generation. Globally, optimism about the economic future is closely linked to a country’s recent economic past. Nations that have enjoyed strong gross domestic product (GDP) growth since 2005 also tend to be more optimistic about the financial well-being of the next generation. Overall, there is a 0.75 correlation between a country’s average GDP growth from 2005 to 2014 and the share of the public who think today’s children will be better off financially than their parents. In African nations that have experienced high growth rates in recent years, such as Nigeria, Ethiopia and Burkina Faso, large majorities believe the next generation will be better off. The same pattern is found in Asian nations that have had strong growth, like China, India and Vietnam. In contrast, many wealthy nations that have struggled with the Great Recession and its aftereffects are relatively pessimistic about the future. For example, in France, Italy and Japan, less than 20% say children in their country will surpass their parents financially.